For 2014 Dodge added the Crossroad to their Journey lineup. Designed to appeal to a younger audience, the changes made for the limited edition Crossroad are both attractive and functional. 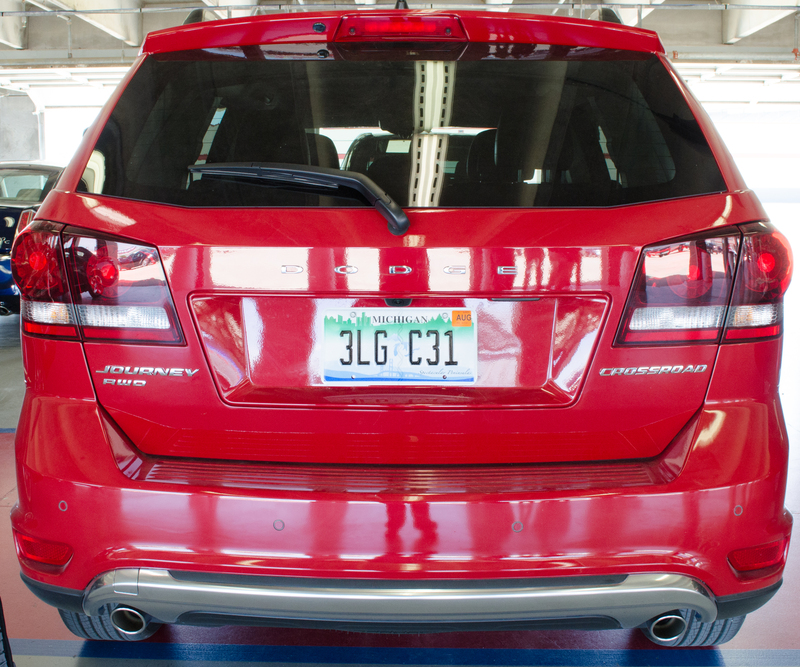 We take it for a quick spin to show you why we like the Dodge Journey Crossroad over the traditional Dodge Journey. 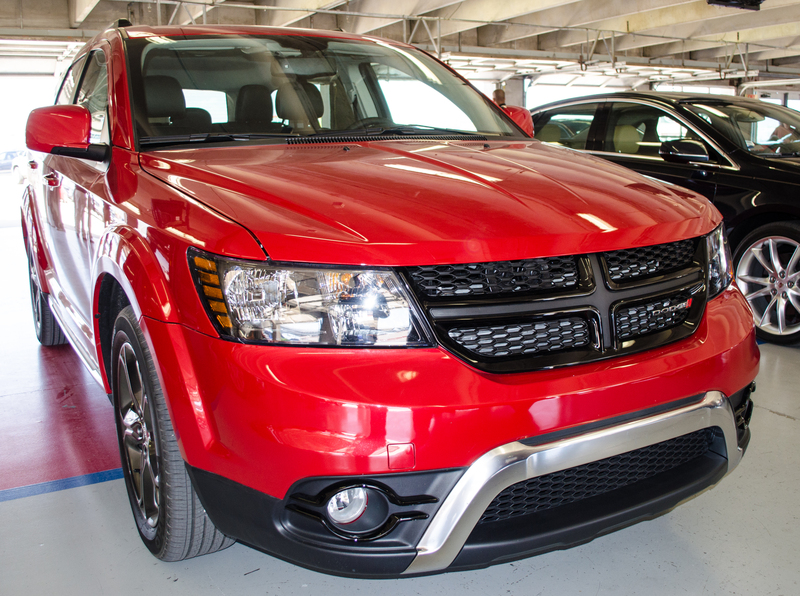 The Dodge Journey Crossroad all-wheel drive starts at $28,395 compared to a front-wheel drive Ford Edge starting at $28,100. That represents good value based on the practicality and technology that comes standard with the Crossroad. 24 mpg on the highway doesn’t knock our socks off, but on par with other all-wheel drive vehicles in this range. The Crossroad has a blacked out grille and headlight accents. 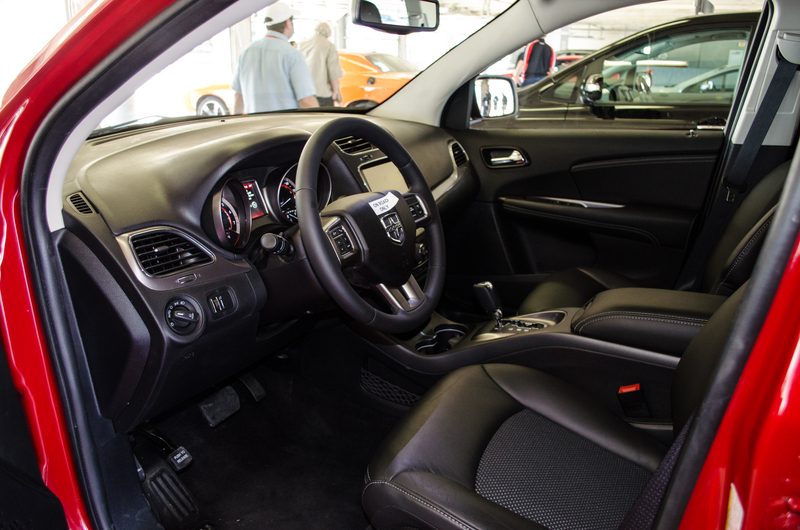 The Crossroad features push button start, dual-zone climate control and an 8.4″ Uconnect touch screen as standard. In addition, storage bins located throughout the cabin, including in the floor in front of the second row, provide plenty of room for storing supplies. Uconnect adds Bluetooth connectivity and a 8.4″ color touch screen for accessing stereo functions. This system performs quickly to touch screen commands and we like the system over systems from other brands. MyFord Touch, one of the big competitors to Uconnect, is slower to respond when zooming in on a map or inputting a destination by using the touch screen. Uconnect doesn’t suffer from the same ailment. Additionally, Uconnect supports Yelp as a way for searching for a point of interest. A negative about Uconnect is that in the Crossroad, navigation isn’t included with the Uconnect screen. One thing that some people find confusing when buying is they see the big touch screen and assume navigation comes with it. It does not. The seats have cloth inserts to improve grip. Uconnect keeps you connected. 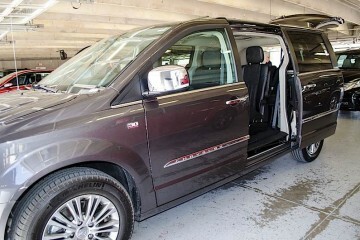 The $995 Navigation and Sound group adds Garmin navigation and an appreciated backup camera with parking sensors. We recommend spending the extra money for the parking sensors. We can see well out of the Crossroad, but bigger vehicles are much easier to park with a camera. 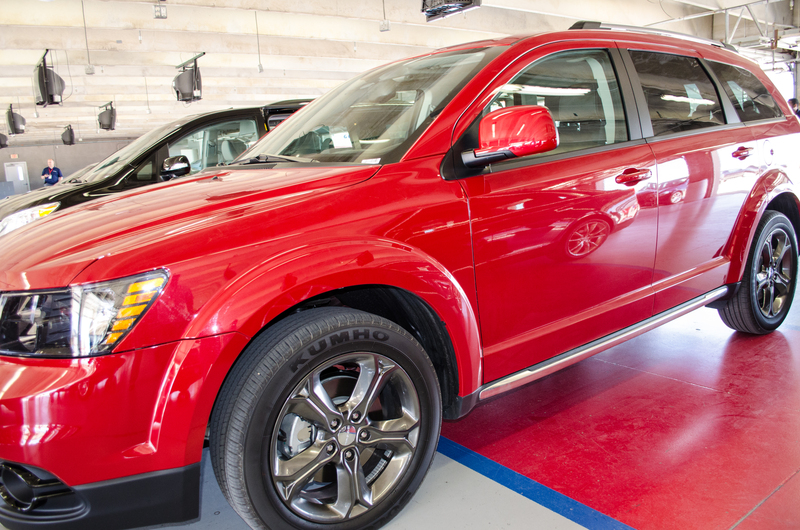 The 3.6L Pentastar V6 makes an appearance in the Dodge Journey Crossroad and sends power to either the front wheels or all four wheels through an optional all-wheel drive system. 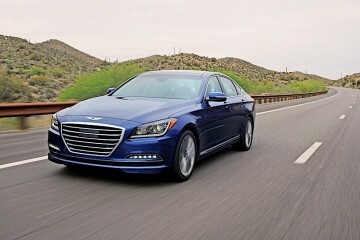 We drove an all-wheel drive version and power was more than adequate for daily driving. The car rides smoothly on the standard 19″ wheels. The hyperblack wheels finish the aggressive look on the Crossroad. The Crossroad uses Platinum Chrome for many of the exterior body pieces. This color appears more blacked out than chrome, giving the Crossroad a sportier look. The headlight surrounds are also black. The wheels are a hyper black aluminum five spoke design. They fill up the wheel wells nicely, finishing the blacked out look of the car. 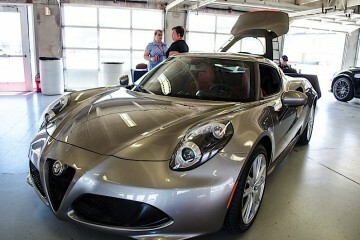 Overall, the car has a very muscular appearance that will appeal to men and younger buyers. The darkened look extends to the rear taillights. If you get this vehicle in all-wheel drive, you probably live in a climate where you get cold and snow. If that’s the case, the $995 Popular Equipment group adds heated seats and a steering wheel. 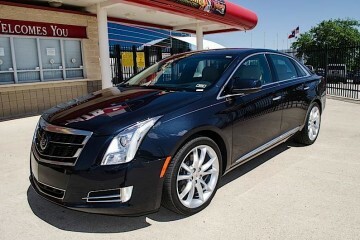 Other niceties include a universal garage door opener and automatic headlights. If you get this vehicle in two-wheel drive because you live somewhere warm, it might be a package worth skipping. If you looked at a Journey in the past and thought that the styling wasn’t aggressive enough for you, definitely take a look at the Crossroad. 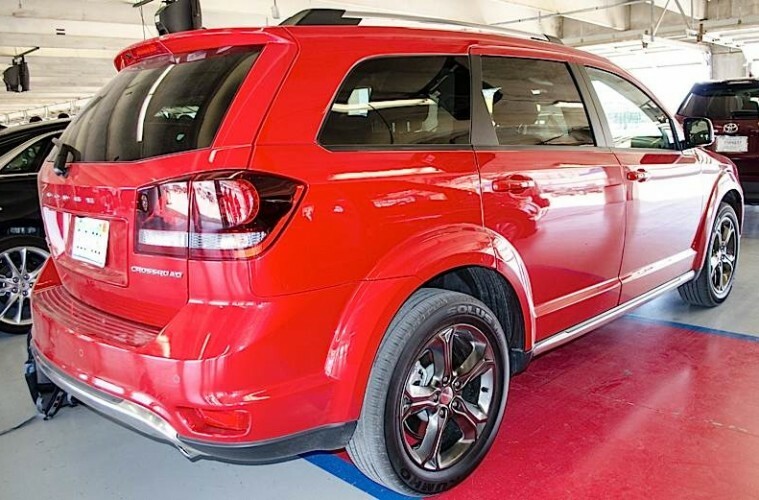 More than just styling changes, the Dodge Journey Crossroad makes the Journey pop and draw attention. 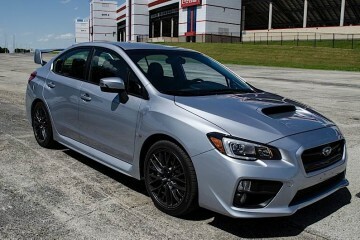 We see this being popular with dads who aren’t ready to give up a sporty-looking car just because they’ve had kids. Pros: Aggressive looks. Good standard equipment. 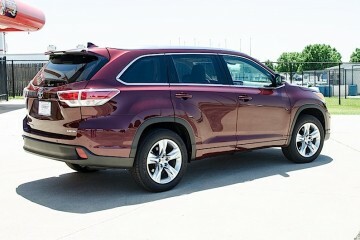 Final Thoughts: Affordable, practical, all-wheel drive crossover.